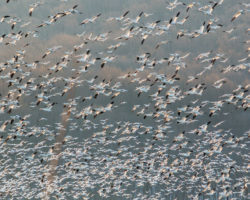 This article is a guest post written by Neil Brennen of ATasteForTheWoods.com. Pennsylvania is crisscrossed with railroads. There are tracks everywhere, and while railroads are still an important means of transportation, there are many lines abandoned. These abandoned lines often are turned into multi-purpose trails for walkers, hikers, and cyclists. From Philadelphia to Pymatuning, Warren to Washington County, there are trails everywhere. Having ridden many of them, I thought I’d prepare a list of the five best rail trails for families. 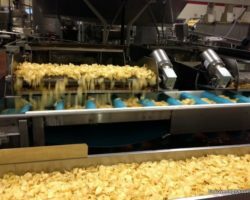 Since these trails are many miles in length, I’m describing a round-trip segment of ten miles or less for each, noting attractions you might see, and suggesting where you might enjoy a meal after the ride. I’ve also kept the list representative of the different regions of the Commonwealth, with no two trails in the same area. 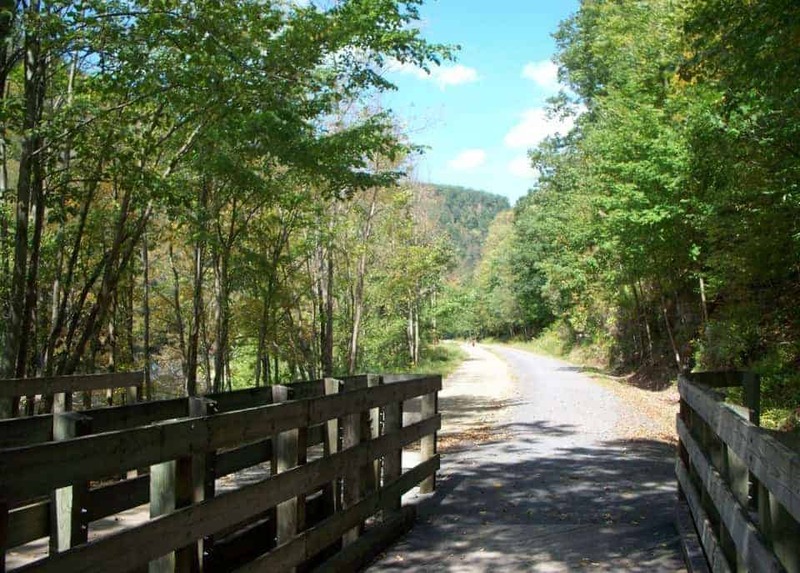 The Pine Creek Rail Trail passes through the gorge nicknamed the “Pennsylvania’s Grand Canyon” as it travels 64 miles from Wellsboro Junction to Jersey Shore. While all of it is worth seeing, to get a taste of the canyon, I suggest starting at Darling Run, the trailhead just off of Route Six. Park in the large lot and head south. You will be in the protected portion of the gorge, looking up on the canyon walls and riding next to Pine Creek. Wildlife is around you, and if you’re lucky, you might see bear, raccoons, porcupine, turtles, and snakes. 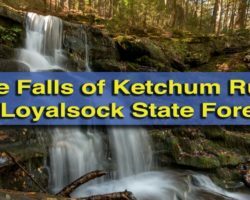 Our ride continues to Four Mile Run, a seasonal waterfall that’s a trickle much of the year, and to the stairs on the Turkey Trail that go up to the overlooks at Leonard Harrison State Park. We turn around and ride back. We pass the Darling Run trailhead and push on a mile to Ansonia’s trailhead, which gives us a view of a tiny church, Marsh Creek, and Mount Tom. We can ride back to the car or, if we have fresh legs, we can ride to lunch at Pag-Omar Farm Market in Wellsboro Junction, adding 16 miles to our ride (or we can just drive there). Oh, and if we forgot out bikes, we can rent them from Pine Creek Outfitters. They are a mile from the Darling Run and Ansonia trailheads, and Route Six is flat with wide shoulders. Aside from crossing the road its an easy ride, and good sense gets you across the highway safely. The Great Allegheny Passage travels 150 miles from Point State Park in downtown Pittsburgh to Cumberland, Maryland. For our ride we are going to park in Meyersdale, near the Maryland border. This is the ‘bridge to bridge ride’, as we are going to ride over two massive railroad bridges. Riding along the Great Allegheny Passage in southwestern Pennsylvania. First, we’ll look at the historic Meyersdale train station, which is also a museum devoted to the Western Maryland Rail Road. The WMRR right of way became the part of the trail we are going to ride. Leaving the parking lot we turn left and ride towards Pittsburgh. In two miles we cross the two thousand foot long Salisbury Viaduct, which soars one hundred feet above the Casselman River. We can stop mid-span to take in the views, and after crossing, we can explore a historic graveyard next to the trail. Then, we ride back, pass the train station, and three miles later, cross the Keystone Viaduct, another impressive railroad bridge. We turn around, head back to the train station, and have lunch at the GI Dayroom down the hill. It’s a steep hill, so perhaps we lock up the bikes and walk down. 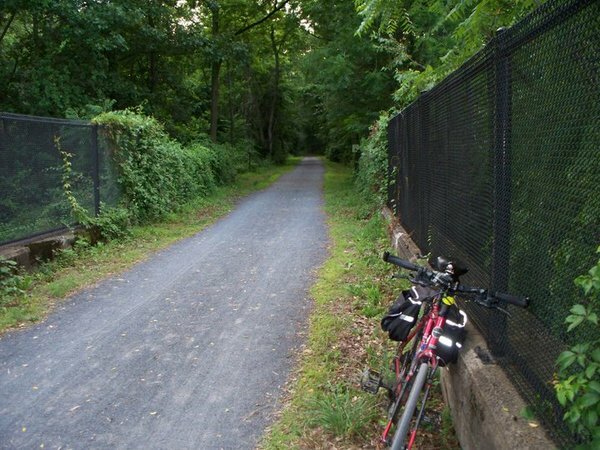 The Bartram Trail is a stand alone segment of the unfinished Schuylkill River Trail. 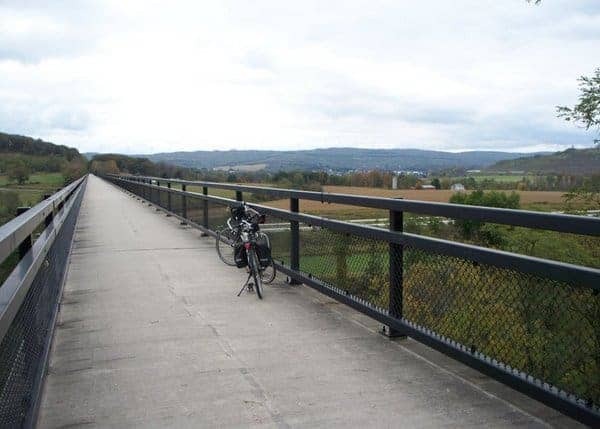 The trailhead is at Kearnsville Dam, outside of Hamburg, although if you feel like adding to the ride, you can park in Hamburg itself and ride a couple of additional miles. A portion of the Bartram Trail. During our ride we cross a railroad bridge, pass above a historic train station, cross the Appalachian Trail at Port Clinton, and dead end at an abandoned railroad bridge over the Schuylkill River. The hills and railroad cuts remind me of western Pennsylvania rather than the flat eastern part of the state. Lunch is at the Hamburg Diner, which we can ride or drive to. The Allegheny River Trail gives sweeping views of the river as it travels south from Franklin to Emlenton. We park at the trailhead in Franklin and head south. Our turnaround is Indian God Rock, a large boulder on the riverside carved with native American markings. If we feel up to it we can continue to the intersection with the Sandy Creek Trail, which crosses over the Allegheny River Trail. We can have a picnic lunch for us back at the car, as there’s no place near the trail to eat, or we can drive into Franklin. Starting from Newville, we head through farmland towards Shippensburg. 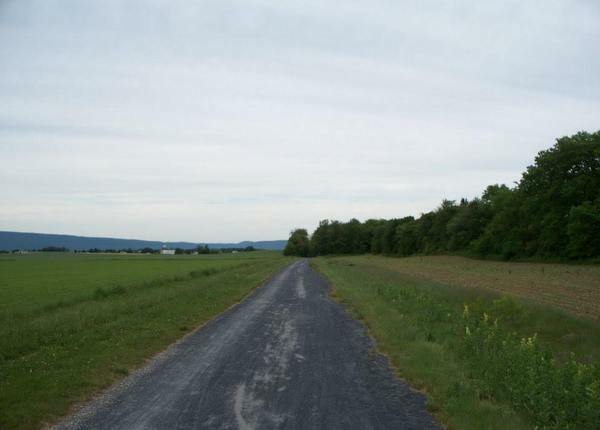 Although the trail is flat, there are stunning views of South Mountain and the rolling farmland of Cumberland County. A portion of the Cumberland Valley Rail Trail. If we have the legs for it, the trail continues on to Shippensburg, ten miles distant. Back in Newville we unpack our picnic basket and enjoy the lunch we brought, or we can drive to Sheetz outside of town. Do you have any other suggestions for great rail trail bike rides that are good for all ages? Let us know in the comment section below! Neil Brennen is a writer and outdoorsman. For most of his adult life Neil was sedentary and super-obese. In 2006 through better diet and exercise he lost 160 pounds. During that transformation he went from potato to potential, and rediscovered the outdoors that had been closed off to him. Through his writing and speaking, Neil advocates that everyone, regardless of challenges, be able to experience and enjoy the natural world. You can follow him on Facebook and on Twitter. I’m kind of surprised there was no mention to any section of our beautiful 165 mile long D&L Trail. There are lot of great rail trails to explore in Pennsylvania, John. I’m sure that limiting the list to only 5 was quite a challenge for Neil when he was writing it. Thanks for the suggestion though. 1. Lehigh Gorge Rail Trail – Jim Thorpe PA – waterfalls in the middle of the trail are particularly scenic. 2. Presque Isle Trail – Erie PA – Spectacular views of both Lake Erie and the Bayfront. 5. Oil Creek Trail – near Oil City PA – Great nature trail with historical sities including the Drake Well Museum. Thanks for the suggestions, Jim. I’ve been on a few of those trails myself and really enjoyed them. All great choices, but I had to keep the list short. I’ve ridden all these trails, and written about a few of them. Allegheny River Trail actually starts north of Franklin in Oil City, Pa and has some very scenic views between Oil City and Franklin. 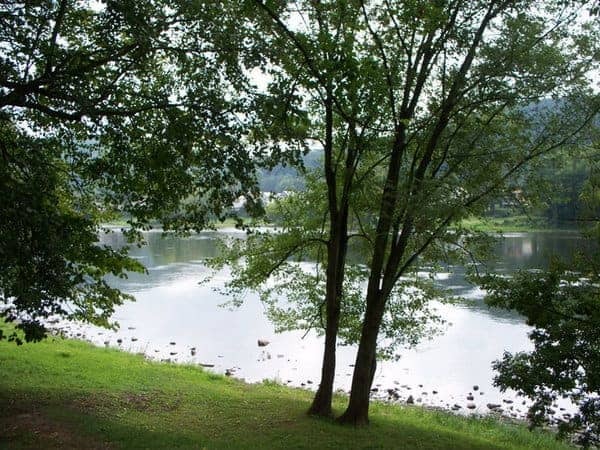 It also has been extended in the opposite direction from Oil City, Pa to connect to the Oil Creek Trail from Oil City to Titusville, Pa which also has some magnificent scenery and hiking trails. Just for clarification, the Lower Trail (rhymes with FLOWER) is in Blair and Huntingdon Counties, with 6 trailheads between Holidaysburg and Huntingdon. The Alfarata Station located off US Route 22 should not be confused with the Village of Alfarata located on US Route 522 in Mifflin County. interesting. i’ve done a lot of rail trails and some of these listed. Union Canal Trail in Berks County.